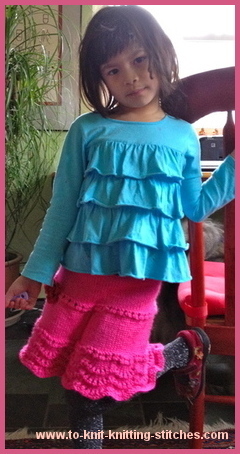 My younger twin daughter wanted to have a pink skirt when she saw me knit a purple skirt for my niece's daughter. So, I came up with this one using a scallop pattern for the 3rd tier. I really like the look of the edge. It reminds me of a crochet scallop edge. Enjoy! and don't forget to send me a photo of it when you're done. Gauge: 4.5 stitches per inch on U.S. needle #8 (5mm). Finished Measurements: Waist Circumference = 22” to fit 4-6 years-old child. Length = 11.5 inches. 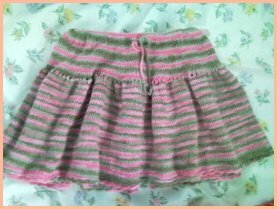 *I had a visitor who knitted this skirt with a 21" waist for her 9 years-old niece. So it's best to check and measure the waist circumference first! 1. 1 balls of Caron Super Soft Watermelon (6 oz/170 – 315yds/288m) or 4-ply worsted weigh yarn of your choice. Waistband: With 16 inch-circular knitting needle Cast on 100 stitches. Place marker. Form cast on row into a ring by knitting into the first cast on stitch, make sure not to twist the row. 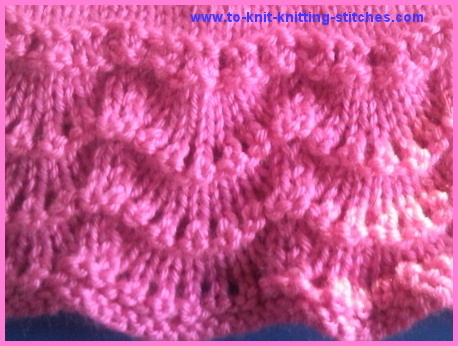 Knit 5 rows. Purl 1 row. Knit another 5 rows. Purl 1 row. This part is a skirt's waistband. Begin skirt body tier 1: Knit 22 rows. P 1 row. Increasing Row to form tier 2: *Yf, k 2; repeat from * to the end. (150 sts total) P1 row. Begin tier 2 body: Knit 22 rows. P 1 row. Row 1: *Sl 1, k1, psso, k9, k2tog; rep from * to the end. Row 3: *Sl 1, k1, psso, k 7, k2tog; rep from * to the end. Row 5: *Sl 1, k1, psso, yf, [k1, yf] 5 times, k2tog; rep from * to the end. Repeat these 6 rows two more times. K 1 row. Bind off purlwise. Attention: In the PDF, I forgot to add a tiny star after the word "rep from" on row 5. Please change it to; Row 5: *Sl 1, k1, psso, yf, [k1, yf] 5 times, k2tog; rep from * to the end. It seams like everyone who made this skirt figured it out! Cut out 22 inches of elastic waistband and sew both ends together to form a ring. Turn the skirt so thatthe wrong side is shown. Place the elastic band horizontally with the 6th row and fold the first 5 rows ofthe skirt waistband over it. Sew along the closing edge of the band with the same yarn using tapestry needle. Weave all loose ends behind work. Block piece if needed. Share Your Skirt Photo and Story Here! Do you have a photo of this skirt? or Just want to share us who you made this skirt for. Wonderful pattern! Less than a ball of yarn, and it took me a week to knit it.